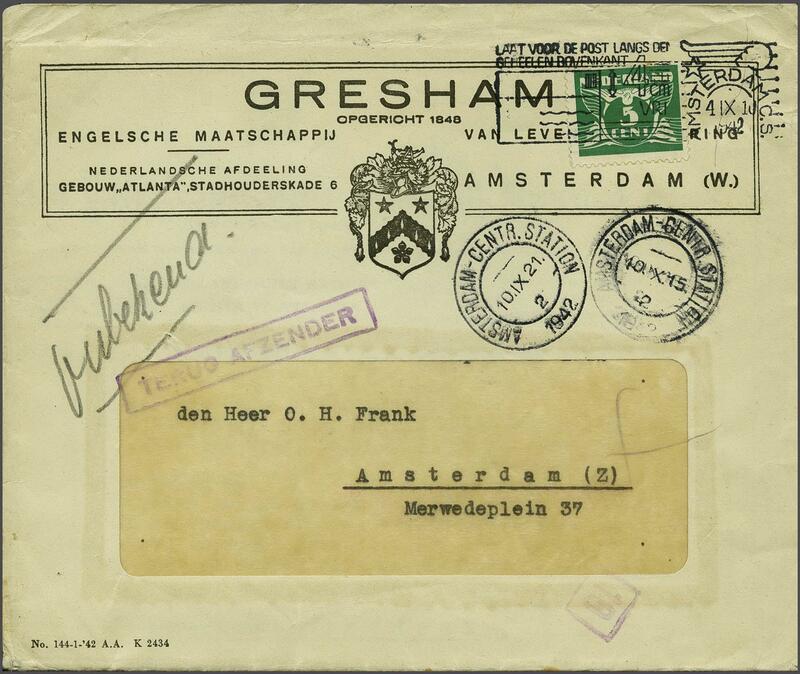 The discovery of the letter had already caused a minor sensation: a letter to Otto Frank, the father of Anne Frank, dated 1942 and still unopened! Now this unique letter, which has caused a great deal of media attention far beyond the country’s borders, was sold at the Corinphila Veilingen auction in the Dutch town of Amstelveen on 21 September 2018 after an intense bidding “battle” for a sensational 9,500 euros. The letter was part of a collection of rare documents put together by the collector Stefan Drukker, as a comprehensive documentation of the difficult years of the Second World War. The letter to Otto Frank - probably a unique testimony of the times - could not be delivered to the former place of residence “Merwedeplein 37” and it calls to mind the most difficult period in the life of the Frank family, their underground existence. This period is described in detail in the diary of Anne Frank, and the sad fate of the family, her life in the hiding-place at the back of the building and the deportation to her death, is now world famous. All this is reflected in the letter recently sold, which has now found its way into the hands of a new owner.